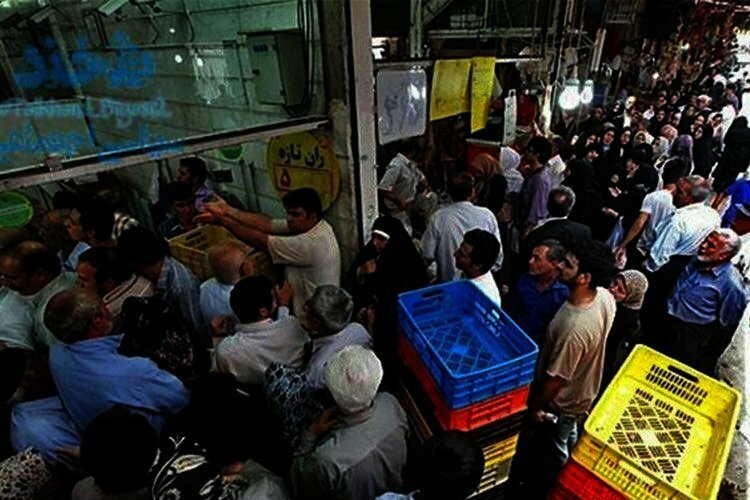 Long lines for subsidized frozen meat imported from Brazil, reminiscent of the bitter days of the Iran-Iraq war, have become commonplace in Iran. Many believe that the long lines for frozen meat shows just how critical Iran’s economic woes are. Forty years into the revolution that brought the Islamic Republic to power, Iranians have lost their ability to afford their basic needs. Inflation has skyrocketed. Prices have soared. The poor have become poorer while workers are laid off as factories go bankrupt. Workers who are still employed are not paid the meager wages they earn. Millions of people live under the line of poverty. Malnutrition of children has turned into an issue for many Iranian families. Nowadays, state media are reporting that the regime is exporting red meat to its neighbors while importing the more affordable frozen meat, once banned by the founder of the Islamic Revolution, Ruhollah Khomeini, for Iranians. There are many reasons behind the increase in meat prices. One of the reasons is the increase in the trafficking of livestock to neighboring countries carried out by those affiliated with the regime and the Revolutionary Guards Corps. According to Hossein-Ali Haji Dalilgani, a lawmaker from Shahin Shahr in the central province of Isfahan, the government does nothing to stop meat trafficking. “The performance of the Ministry of Agricultural in relation to meat prices is erroneous and the trafficking of livestock must be prevented,” he said in the Iranian parliament on January 29. The part played by the state in the meat trafficking business also became evident after the January crash of a cargo plane, which killed 15 people. Experts have raised questions as to the relationship between the Boeing 707 cargo plane, carrying fresh or frozen meat for a private company and the Iranian army. There are speculations as to why an army Amir (2nd Brigadier General or higher), four colonels and seven captains and lieutenants were on the plane to import 30 tons of mean from Kyrgyzstan to Iran and why the plane was trying to land in a RGC military airport. According to the Minister of Agriculture, 2 million livestock were being trafficked to other countries. “Currently there are 2 million livestock being trafficked to other countries. This is a national capital and this capital is taken to countries in the Persian Gulf from the west, northwest and south of the country,” Mahmoud Hojjati said without specifying who was involved in the trafficking. This amount of livestock can only be trafficked by a powerful entity with the state’s support. Iran’s borders are fiercely controlled by the regime and border porters or kolbars in Iran’s western regions are shot, injured and sometimes killed by border police on a daily basis for carrying smuggled goods on their backs. Recently, in a TV program when asked about soaring meat prices, the Minister of Agriculture said, “thank God we have this much”. This and other economic woes has angered many people who say that they have not been able to eat meat for months. In an interview with the Associated Press, Zahra Akrami, a mother of two recently said that despite waiting in the frozen meat lines for two hours, she was told to come back another day after the meat ran out. “Every day, the radio and TV are reporting about the trial of those officials who took public funds for themselves, but there’s no change in our life,” said Assad Azari, a 63-year-old retired teacher and father of three waiting in line. “We poor people shouldn’t have to wait hours for two kilos (4.4 pounds) of budget meat,” he told AP.